This course may also be of interest to graduates with qualification in non-computer disciplines who wish to learn more about writing computer games. The purpose of the course is to provide students with a firm foundation in the craft of writing computer programs and creating 2D and 3D computer games. Students will gain the necessary knowledge and skills to understand how computers work and can be used to model the physical behaviour of real world objects. This course will present learners with the opportunity to appreciate the programming considerations that arise with different game genres such as adventure, First Person Shooter (FPS), Role Playing Games (RPGs), strategy, fighting and sports games. Play and critique a variety of games on a selection of popular platforms (e.g. X-Box, PS3, PC etc). Use specialised game engine tools to create their own game components (levels, maps, characters etc). Write and test their own computer games (2D and 3D). Use life skills including effective communication techniques, teamwork and independent learning. There is a very strong emphasis placed on games design and development. 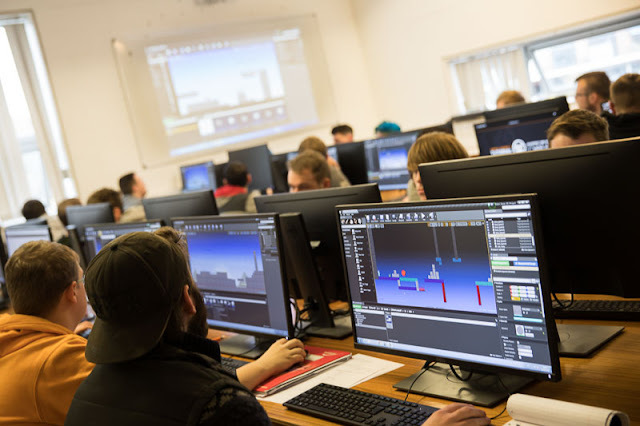 By the end of this course all students will have been given the opportunity to build a substantial portfolio of their own computer games. Examples of some of the technical tools used to create games are PyGame (for developing games in Python), Scratch (for developing 2D games) and Greenfoot (for the development of games in Java). In addition, students are given the opportunity to learn how to use Unreal Engine 4 to create their own stunning high-end games. Students will also be given the opportunity to prepare for and achieve certification in the much sought after Oracle certification. *Each Year www.onlinedesignteacher.com makes up to 6 work experience places available to our computer games programming students to work on UE4 programming tutorials. The games industry is one of the fastest growing industries in the world and opportunities are plentiful in Ireland and abroad. Examples of job titles include animator, background artist, game programmer, engine programmer, modeller, designer, script writer and game tester. Current skills shortages means employment is virtually guaranteed, particularly for degree level graduates. At Cavan Institute: Students who successfully complete this course meet the entry requirements for a range of level 6 courses at Cavan Institute, including Software Development (Year 2), Computer and Network Technician (Year 2), and Computer Games Development (Year 2) and Computer and Technician (Year 2). Graduates of this course are eligible to apply directly to Cavan Institute to enter year 1 of the B.Sc. (Level 7 degree) in Computing run in conjunction with Letterkenny Institute of Technology. Elsewhere: Graduates are also eligible to apply through the CAO and/or the Higher Education Links Scheme for entry to year one of a range of higher certificate and degree programmes (e.g., Computer Games Development, Software Engineering, Applied Computing or Software Design – Games) at Institutes of Technology and Universities (please check with the particular institution regarding local eligibility requirements).